We recently met a fellow US student who was considering moving here to Durham to complete his PhD. He asked us the question, “How did you physically move your belongings?” The best way to move abroad depends on how long you will stay in the country you are moving to. If you are moving from the US to the UK for 3 years or less to complete a degree then the best and most economical way to move is to only bring things you must have and pack them in suitcases. We rented a house that was mostly furnished. The small amount of furniture that we still needed we purchased at the British Heart Foundation Store on North Road. It is located directly across from the bus station. The UK has many Charity Shops they sell gently used and sometimes new items. There was a small flat fee delivery charge so we made certain to pick out the furniture and small kitchen appliances we needed at one time to save on the cost of delivery. We were able to pack bedding, towels, wash cloths, kitchen items, clothes, toys, school books (including all of Joshua and Meg’s homeschool curriculum) and Christmas decorations. We packed our books and curriculum in our rolling carry on luggage because they normally do not weigh those. 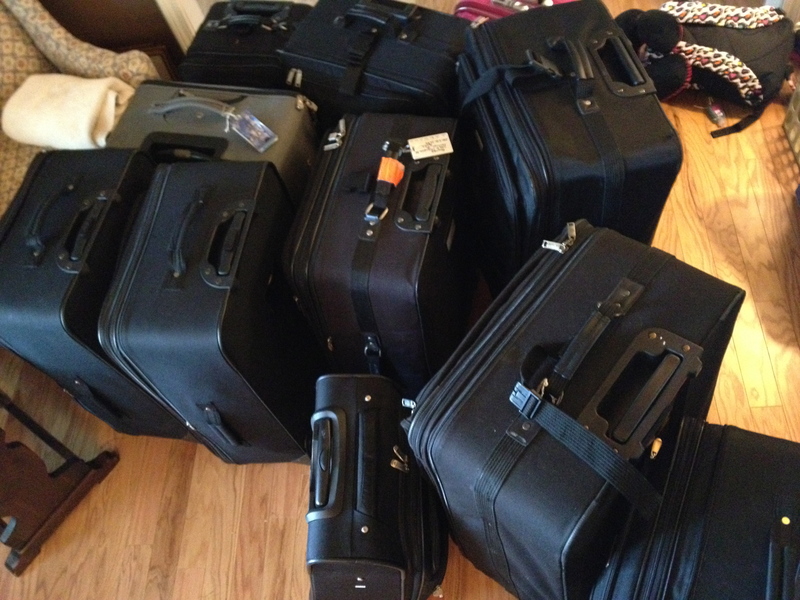 We each had two large checked suitcases and one rolling carry on. We were hoping to gate check those because they were so heavy but a few times we had to grimace and lift them in to the overhead bins. There were four of us and we packed a total of three bags each which brought our grand total to 12 bags. We were able to pack everything we needed to live for one year in those bags plus we brought a few sentimental items to make it feel more like home. We allowed half of a large suitcase for the kids to fill with lightweight toys of their choosing as well. 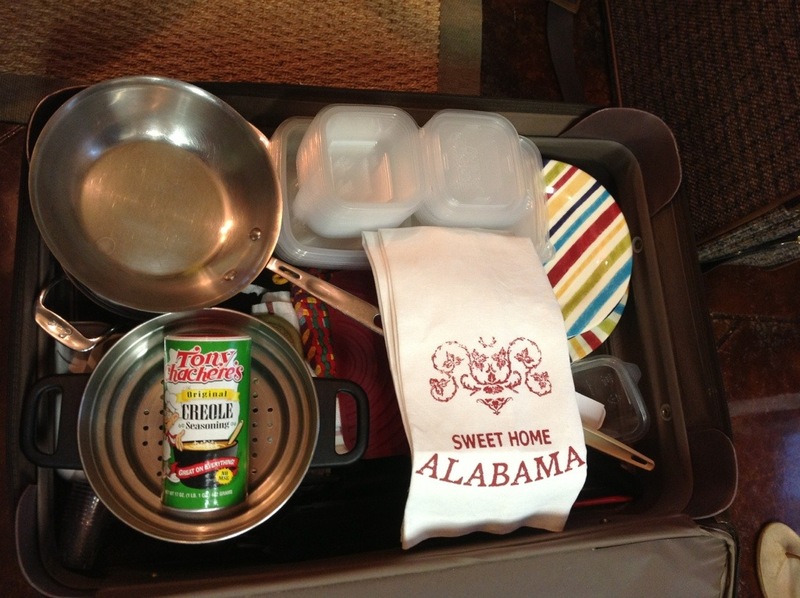 Many Kitchen items – What do you REALLY need in order to cook meals? I decided that I only needed a small frying pan, small stock pot with a removable steamer, flour sack dish towels, wash rags, measuring cups and spoons, mix and stir spatula, small cutting board, grater, veg peeler, wooden spoons, a hand held pastry blender, a whisk and a few of my good kitchen knives. We also purchased non breakable melamine plates and bowls and brought those with us. We picked up baking sheets, bread pan, muffin tins, mixing bowls and such after we arrived. Lots of shoes – Leave them in the states. You need a really good set of water proof walking shoes (I bought Timberland Hiking boots), a few sets of dress shoes and tennis shoes (trainers) for spring and summer wear. We choose not to have a car and we walk everywhere. Good, comfortable, water resistant shoes are the best investment for Durham living. It really seems to be a daunting task to pack up your life into a few suitcases but you may find in doing so that there is much that you can live without and a life not weighted down by material things can be much richer that you could have imagined. We have found patience and creativity we did not know we possessed. Never say no to adventure my friends. You’ll be blessed along the road. Ah yes Island Girl. Your shoes are so beautiful! To England I brought a pair of Timberland Hiking boots, a pair of black flats for dress, neutral heels, riding boots (that I never got to wear) a pair of flip flops (that I wore twice and my feet froze) oh and one pair of trainers. Even that seemed like a lot when packed into suitcases.